Heat oven to 425°F. Remove crust from pouch; unroll on work surface. Using large round cookie cutter, cut out rounds. Gather up any scraps; reroll with rolling pin and cut out more rounds to make a total of 10. Press each crust round into ungreased regular-size muffin cup. In medium bowl, stir together apples, sugar, flour, cinnamon and vanilla. Divide mixture evenly among crust-lined muffin cups. Bake 18 to 20 minutes or until crusts are golden brown and mixture is bubbly. Cool completely in pan, about 30 minutes. With knife, loosen edges; remove mini pies from muffin cups. Have extra pie crust? There will probably be a little leftover. 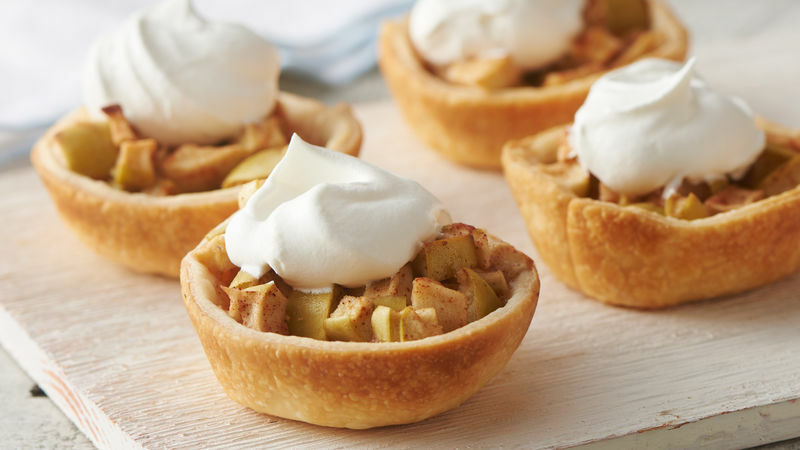 Roll it out and use mini pie cutters to cut pieces. Then place them on top of the mini pies before baking. Pears can be used in place of apples.